Goodreads says, "When a soldier with a troubled past and a struggling songwriter agree to a marriage of convenience for the military benefits, neither expects much after saying “I do.” Then tragedy strikes, and the line between what’s real and what’s pretend begins to blur in this smart and surprising romance perfect for fans of Nicholas Sparks and Jojo Moyes. Cassie Salazar and Luke Morrow couldn’t be more different. Sharp-witted Cassie works nights at a bar in Austin, Texas to make ends meet while pursuing her dream of becoming a singer/songwriter. Luke is an Army trainee, about to ship out for duty, who finds comfort in the unswerving discipline of service. But a chance encounter at Cassie’s bar changes the course of both their lives Cassie is drowning in medical bills after being diagnosed with diabetes. When she runs into her old friend Frankie, now enlisted in the Army, she proposes a deal: she’ll marry him in exchange for better medical insurance and they can split the increased paycheck that comes with having a “family.” When Frankie declines, his attractive but frustratingly intense friend Luke volunteers to marry Cassie instead. What she doesn’t know is that he has desperate reasons of his own to get married. In this unforgettable love story, Cassie and Luke must set aside their differences to make it look like a real marriage...unless, somewhere along the way, it becomes one.."
Cassie's world is turned upside down when she is let go from her steady job. Instead of falling apart, tries to make the best of it by focusing 100% on her music career as that is her true passion. Cassie is a part of a band and now that she doesn't have a job and can focus on music, she is hoping that her band will take off. She is bartending to pay the bills, but there's one problem. She doesn't have health insurance and the timing couldn't be worse. During one of her gigs, she faints and finds out that she is suffering from diabetes, which is a costly disease. Without insurance, this would be a disaster financially. One night her childhood friend, Frankie, walks into the bar she is working at and they reconnect. She meets a few of his friends who are all in the Army and heading off to fight in Afghanistan. Later on, she asks Frankie if he would "marry" her, so they could receive more money from the government as a married couple and she'd have better health benefits. Frankie says no, but his good friend, Luke, is interested. But Luke isn't doing it just for Cassie. He has his own issues and needs more money immediately. Can they pull this off and make it look like a real marriage? 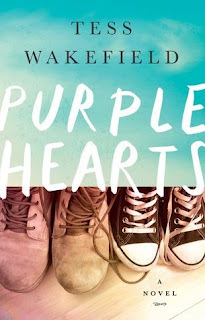 Tess Wakefield's Purple Hearts is a compulsively readable story about an unlikely romance. I absolutely adored it. Cassie is an interesting character in Purple Hearts. I didn't always agree with her choices, but I cared about her a lot. Her true passion is with her band and while I wanted her to pursue her dreams, it wasn't very practical, especially when she is diagnosed with diabetes. In walks Luke, who she doesn't hit it off with at first, but they have some sort of connection. They decide to enter into a marriage of convenience; however, it shouldn't be taken lightly as it's fraud. If they get caught and the consequences are devastating. Can two people who barely hit it off at their first meeting convince the world that they are in love? Cassie isn't too worried about it, because she knows that Luke is going to be shipped off to Afghanistan soon and they won't need to interact too much other than through Skype. Once he is home, they can get a divorce, right? I adored Luke in Purple Hearts. I was rooting for him from the beginning. He isn't perfect though, but that's why I appreciated him. His back story will definitely tug on your heartstrings and he fights his own demons daily. His own difficult situation gets even more complicated with the return of someone from his former-before the army-life. He needs more money as soon as possible, so marrying Cassie seems like a good deal. He just wants to gain the trust back that he broke with his younger brother and his family. Luke just wants his life back, but things keep getting in the way. Things happen in Afghanistan that complicate things further for Cassie and Luke in Purple Hearts. I don't want to give too much away, but I absolutely adored their journey. This book had me flipping the pages late into the night and I just had to know how things would end up for them. What is even more exciting is that Purple Hearts has already been optioned for film with Gina Rodriguez playing Cassie, which is perfect casting. I think this book will translate very well to the big screen and I can't wait to see who they cast as Luke. So, if you're looking for a book that will tug on your heartstrings and one that is filled with an unlikely romance which will have you swooning, definitely check out Purple Hearts this summer. 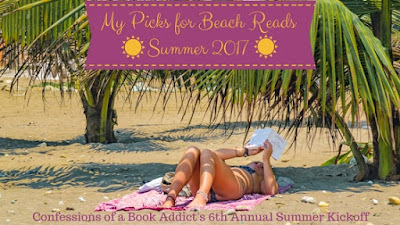 It would be the perfect read for a lazy summer day or a relaxing day at the beach. Wow! I think it would be a great movie and I actually pictured Gina Rodriguez as Cassie when I was reading the book! I have to be honest that I struggled to like Cassie at times. I thought she was pretty immature and whiny. I liked Luke so much more. I hope they improve Cassie's character in the movie. Great review! It is definitely a page turner. Yes! She is the perfect Cassie. You are right...Cassie was super annoying at times, but I definitely cared about her. Thanks for visiting, Christina, and I am glad you enjoyed this book as well.